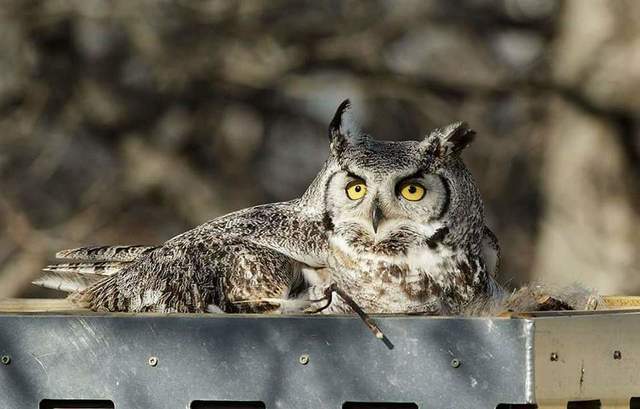 It’s currently mating season for our largest owl – the Great Horned Owl! These owls mate in January or February and are usually on their nests by March. Because they nest so early, they do not build their own nests. This is because most nest-building material is hidden under the snow. 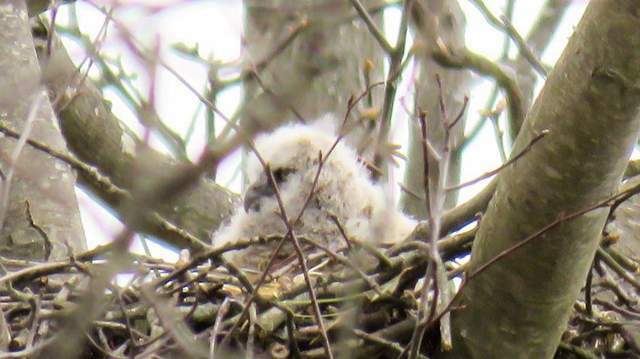 They instead use the old nests of Red-Tailed Hawks, Bald Eagles, or American Crows. They will not do any repairs either, so nests are often unusable for the following year. Individuals do not breed until they are two years old. Pairs of owls may be heard hooting often during winter or spring courtship. Competitive hooting between males may also be heard. In fact, these owls will even respond if YOU hoot – if you sound somewhat like an owl, that is! You can go to places where these owls gather for mating and listen for them and respond, or you can try to hoot to grab their attention. If they think you might be an owl, they will hoot back and forth with you! I once had a 15 min. ‘hooting session’ on a January night hike which was also during a full moon – with what probably ended up being one very confused male Great Horned Owl! Once these owls are ready to nest, one to six eggs may be laid, though more commonly two or three. Incubation is done mostly by the female and lasts about a month. The young first fly 63 to 70 days after hatching. The adults will even feed the owlets on the ground if they have not yet mastered flying. The owlets develop slowly and do not usually become fully independent until late summer. So if you ever see one of these owlets at the base of a tree, as with any fledgling, leave it be. It will still be looked after. One summer evening, while leading a dusk/night hike at Beaver Creek, near Saskatoon, two Great Horned Owlets were screeching for their parent(s) while sitting at the edge of a tall embankment. The adult replied to their screeching, refusing to come to them. So both owlets started to fly, flew into each other when they were trying to land on the same branch, and fell to the ground. They sat on the ground, clearly dazed. The parent never came – perhaps it was due to embarrassment that we hoomans witnessed it all! Eventually, the owlets moved on. - and I couldn’t have asked for a better show for my group! If you want to head out on a night hike, you can also listen for and view other nocturnal and crepuscular animals. Dusk is the best time to start, as it is the most active time. Crepuscular animals are active at dusk and dawn. Diurnal animals are active during the day, and nocturnal animals are active at night. Nocturnal animals have a row of mirror-like cells behind their retina, called the tapetum – that will reflect when light is shone into them. Just like shining a light into a mirror – it will reflect back. You will need to buy some red cellophane to tape over your flashlight. This is usually available at dollar stores and craft stores. Most nocturnal animals cannot see color, so this is less disruptive than a white light - and you can actually often determine the species of animal you are looking at by the color reflected back from their tapetum. Owls’ tapetums glow red. Raccoons reflect yellow. Bears reflect orange! So if you want to go on a night walk, starting at dusk is a good time as that will be the most active time for many animals. You must, however, remember to be quiet and respectful when visiting the habitat (homes) of these animals - that is, unless you want to ‘hoot’! And now is the time to do so - just maybe do not do so on a first date! So, how do owls hunt? One important aspect of hunting at night is the ability to fly silently, thus not scaring away their prey. The prey is generally nocturnal, and these owls can silently zero in on them with the use of heightened senses, facial discs and soft, silent feathers. These primary wing feathers have serrated edges. When explaining this to groups of children, I show them a hawk feather vs. a Great Horned Owl feather. Not only can you clearly see the difference (the eagle feather ‘zips’ back together), but you can also hear the difference. Taking each feather, and swiftly raising and lowering it, the eagle’s makes a prominent sound, while the owl’s makes no sound at all. Other raptors (birds of prey), such as eagles and hawks rely on the use of swift flying, rather than silent. 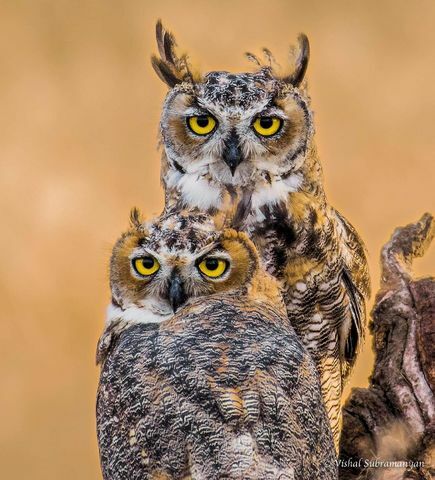 Great Horned Owls will eat almost any kind of prey that moves, (rodents, birds, reptiles, amphibians and even insects), however usually only at night. But in the ‘Weird or What’ files, I actually witnessed an unusual occurrence. And not once, but twice in one day. This confirmed to me that these owls will adapt to unusual behavior in situations where more prey may be available. At Beaver Creek, with my morning class of Grade 5 students, we watched a Great Horned Owl swoop down to the creek and grasp a swimming muskrat with its sharp, powerful talons. Then the same thing happened in the afternoon, with the other half of Grade 5 students to witness. Their sharp beaks and talons would then rip this, or other prey, into bite size pieces for themselves and also for the feeding of their owlets. Favorite prey includes rabbits, hares, mice, even skunks. The pungent smell from a skunk does not deter them, and as a result their nests and bodies are commonly very smelly! During the day you can hunt for signs of these owls by looking for their pellets. Owls cannot digest bones and fur, and so cough up pellets that contain this material from their prey. Taking apart a pellet will show you what the owl has eaten. 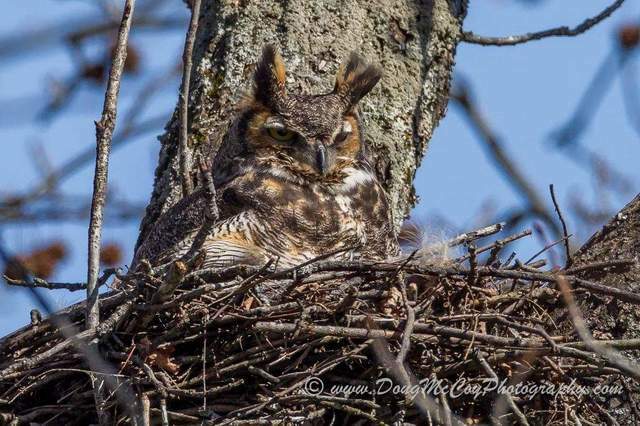 Commonly the pellets are below a nest or roosting site, and if you look closely you may even see the outline of one of these large owls, prominently showing the feather tufts which gave them the name; Great Horned Owls.Raptors (birds of prey) have the world’s sharpest eyes. But a hawk or an eagle’s eye-sight is much different from that of an owl’s. For one thing, the diurnal raptor’s (those that are active during the day) eyes see their prey clearly and in sharp detail from far away. Their retinas contain many light-sensitive cells called cones. Nocturnal raptors need to see clearly in very dim light. Owl’s eyes have lots of cells called rods, which allow them to see well in low light. 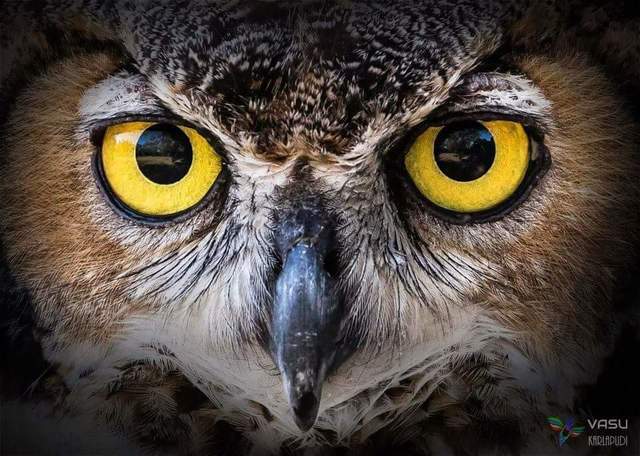 We may see it as darkness, but owls such as the Great Horned Owl, can see perfectly. They are, however, color blind. Most bird’s eyes are set on the sides of their heads, which gives the bird a better ability to sense motion, such as from predators. Owls have their eyes set close together, and on the front of their heads. This ‘binocular vision’ allows both of their eyes to focus at the same time and allows them to see in three dimensions. And their binocular vision is 100 times more powerful than ours, although they cannot move their eyes in their sockets such as how we do. Owls may not have the full perception on each side as other birds do, however they make up for it with their ability to turn their heads 270 degrees, which is about three quarters of a circle. An owl’s eyes are also very large in relation to their face and body. They can focus well at long distances, but some owls have trouble focusing up close. Although primarily nocturnal, these owls will sometimes hunt during the day. In addition to powerful eyesight, an owl’s hearing is also very well adapted. They have facial discs to collect sounds and have ear slits behind these discs. One ear slit is higher than the other and each perceives auditory clues separately, helping the owl pinpoint the exact location and height of the sound. An owl can zero in on its prey by using its hearing alone, even if the prey is almost 1 km away! If the prey is a mouse in winter, underneath the snow, they can hear it. They hear high frequencies the best, such as that of a squeak from a mouse. 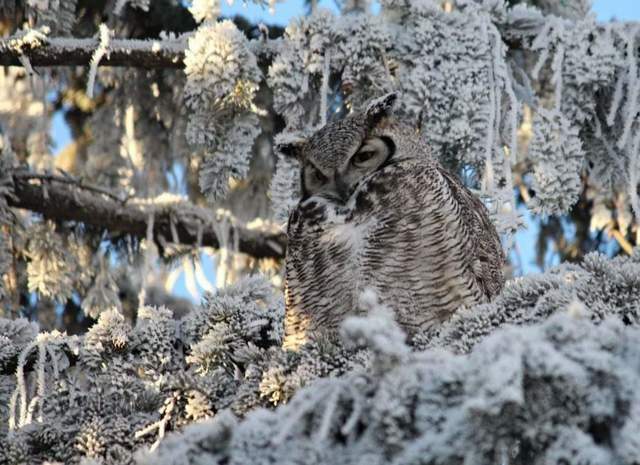 It is really very remarkable how Great Horned Owls are able to sense their prey. They don’t, however, have a keen sense of smell. And so preying on a skunk is no problem for them. However, compared to other birds that may eat foul meat, owls will usually toss such food aside. So, now you know owl you need to know about Great Horned Owls, but if you have any questions about this or any other owl species, please feel free to ask in the comments section and I will do my best to answer them. Also, if you would like to learn more about owls, which species we have in our province, and their unique adaptations, join me and the Moose Jaw Nature Society for a program on owls (including a film and slide show) on Friday, January 25th (6:30 pm) at St. Mark’s Church. We will be meeting in the basement, 80 High Street East, and refreshments will be served. The program is free of charge. Plans are also being made, providing a suitable site is found, to go on a night hike to “converse”with the owls. Hike details TBA. So, see you owl soon! Epp is an Environmental Writer as well as Field Trip Coordinator and President of the Moose Jaw Nature Society. She can be reached via the nature society’s Facebook page, or at kepp@shaw.ca.